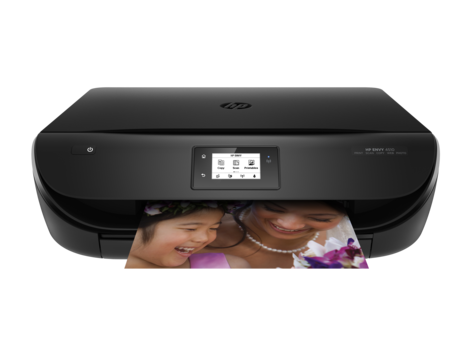 The HP Envy 4526 is a high quality, all-in-one printer with copy, scan and print functions. It boasts a maximum resolution of 1200 x 1200 dpi for mono prints and 4800 x 1200 dpi for colour, which is ideal for any work-based documents. Overall, the HP 4526 punches above its weight in the entry-level inkjet segment. It features the HP Thermal Inkjet system and HP Envy 4526 inks come in standard and high capacity options. The Envy measures 44.5 x 36.8 x 12.7cm and weighs just under 5.5kg. It has a robust build with a flat top and curved front end, with a brushed black finish. It is made for desktop use, so it can be housed anywhere at home or in the office. All operations are made via a 5.6cm monochrome LCD display located at the front and centre, with the on and off button being the only physical input on the unit. There is Wi-Fi connectivity and a direct USB connection. The HP Envy 4526 excels in terms of print quality for both text and images. It is easy to set up and the small touchscreen display provides a range of useful functions. There is extensive support for mobile devices and the cloud, and numerous operating systems, including Windows 10. It is also compact and affordable and the Instant Ink initiative can cut down on running costs considerably. The HP Envy 4526 is slow to print, with real world tests showing results of less than 1.5 pages per minute for a bulk load of documents. The two-cartridge system can be expensive, especially if the Instant Ink initiative isn’t used. The printer is designed for light office use but it is hampered by small and flimsy input and output trays. It also lacks ADF or memory card support.